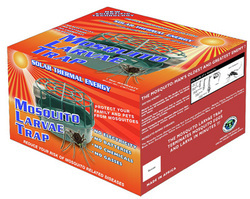 Destroys all mosquito eggs & larvae DEAD in minutes!! Most efficient mosquito killer machine in the world! add a little water, and that's all! HOW DOES THE MOSQUITO LARVAE TRAP WORK? 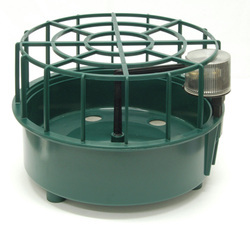 The Mosquito Larvae Trap is new technology being introduced to reduce the mosquito population. The size of the trap is 10 inches in diameter by 7 inches tall. The color is dark green. Manufactured from high grade plastic, and durable. One year manufactures warranty. The functions of the trap are automatic. All you do is add two liters of water to the reservoir. Inside the reservoir is a tray that automatically lowers at night to allow the mosquitoes to lay their eggs, during the day, the tray automatically raises out of the water, terminating the eggs and larvae, which over time will reduce the mosquito population. The top guard is to stop the animals from drinking the water. Malaria, Filaria, Heartworm, Dengue Fever, Brain Fever, Encephalitis, Yellow Fever, La Crosse Encephalitis, West Nile, Chikungunya and many others. Mosquitoes lay 300 to 400 eggs at a time called a raft. 30,000 to 40,000 mosquitoes will be decimated!